Harvey Beef was pleased to support the WA Rural Media Association by providing a carton of West Australian Beef Rump for the very popular “Guess the weight” round. Congratulations to the team at AEGIC who were on the mark and won the carton of beef as a prize. 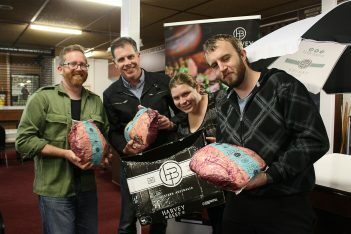 Australian Export Grains Innovation Centre’s (AEGIC) Chris Carter, Grant Powell & Emily Powell and friend of AEGIC Mark Segec with their Harvey Beef supplied meat pack they won for guessing closest to its actual weight.